How do you convey the spirit of Scotland without resorting to tartan and thistles? How do you convey the authenticity of a three centuries old brand while also appealing to a new, younger audience? These were the challenges the Belhaven brewery presented to agency Ziggurat Brands for the rebranding of its craft beer range, launched January 1st. 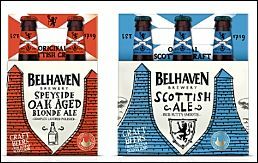 The names of the beers such as Twisted Thistle, play to the Scottish no-nonsense, caustic sense of humour and this is accentuated by the hand-drawn illustrations, the three-word descriptions of flavour on each bottle, and the vivid colours used to distinguish each variant. “The overall sense is of something hardy, something robust, something typically Scottish,” says Kimmins. Finally, the saltire on the neck label confirms the pride the brewery feels in its heritage. This is a brand which works not only on label but across the full range of point of sale materials from pump clips to beer mats and towels, and even T-shirts. The new brand initially encompasses five beers, but there are plans to extend the range further.